One hundred garden owners who live at Seaton Carew in Hartlepool have every right to feel aggrieved after it was discovered that the soil is contaminated with arsenic and lead. Although Hartlepool Council says the risks are very low, they have received £4million from the government to assist in the operation. The site was formerly used to treat pit props and it is thought the chemicals were seeped into the soil. However, residents are angry that the money will not cover all of the works and the re-instating of patios and walling will not be covered. 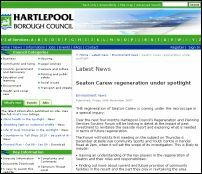 Juicer says: This is a great shame for the Seaton Carew residents and I can sympathise. Are there assurances that the soil being replaced has been sterilised and has a certificate of conformity? How do the residents know that whilst one problem is being addressed the gardens are not going to be plagued with huge weed infestations in the future?